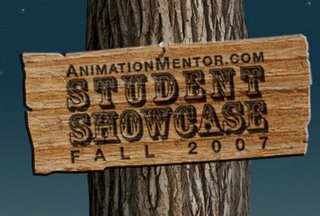 Check out the latest highlights of the work being done by students at AnimationMentor.com. I'm teaching there again this semester and I'm always amazed at the talent they attract. Oh, I can just watch that over and over... it is so inspirational! I'm just starting class 2 and it's so great to finally be a part of AM, so awesome to finally be learning!!! The students and staff are so passionate about animation. I couldn't have asked for a better school! Very cool. I hope to be on that someday.